Spring rolls are a great finger food that everybody loves. 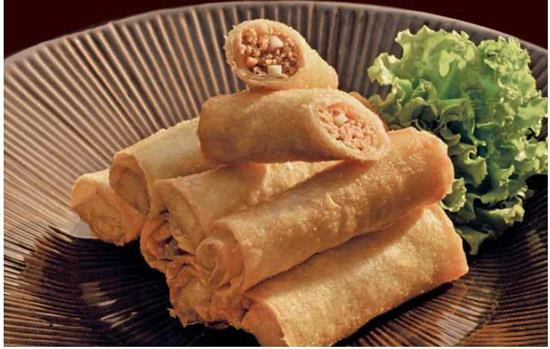 Filipinos know them as lumpia, which is derived from the Hokkien word meaning “mixed vegetables and meat rolled up.” This version, Lumpiang Shanghai, refers to a spring roll stuffed with ground pork and then fried, but ground chicken, shrimp or crab can also be used. Always make some extra spring rolls and store them in the freezer for a quick meal later. When frying, use medium heat to be sure that they cook through completely but be careful not to burn the outside. Use smaller 6-inch square wrappers make perfect-sized rolls; if you use larger wrappers, simply cut the cooked spring rolls in half before serving. 1. Combine all the Filling ingredients in a bowl and mix thoroughly. 2. Place a wrapper on a flat surface and spread about a tablespoon of the Filling all along the bottom third of the wrapper. 3. Roll the wrapper over the Filling, tuck in both ends, and roll it up tight. Moisten the edges of the wrapper with the egg white and press to seal. 4. Heat a medium saucepan or wok over high heat and add the oil. Use a wooden chopstick or skewer to check if the oil is hot enough. When it’s hot enough, bubbles will form all around the stick. (or use a deep-fryer thermometer, which should be between 350° and 375°F when ready). Reduce the heat to medium once it reaches the desired temperature so that the oil doesn’t burn. 5. Deep-fry until brown and crispy. Do not overcrowd the pan. Serve hot with Sweet and Sour Sauce or Spicy Garlic Vinegar Dipping Sauce. For a light meal, serve with hot steamed rice.